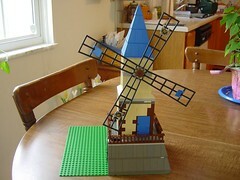 Added picts of a windmill I'm building for BrickFest. Erika and I are excited about going to Arlington, VA for BrickFest. We plan to spend some time at BrickFest & do a little sight seeing of Washington DC -- we both haven't been to DC in awhile. We'll be taking our new digital camera, so I should have pictures up quickly when we get back. Note: We didn't do much sight seeing... ended up having a good time at BrickFest that we never got around to seeing DC.